What you gain from Columbia College doesn't stop with graduation. The CCAA offers many benefits, opportunities to get involved and resources to more than 89,000 alumni living worldwide. You automatically become a member upon graduation. There is no set-up fee or registration process! Discover the benefits you've earned and how you can stay connected to your alma mater. You've earned it. Alumni Lapel Pin: Designed in 2014, this navy and silver pin features the beautiful Rogers Gate. 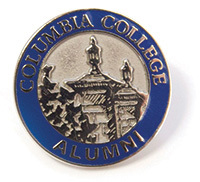 Graduates who participate in any Columbia College commencement will receive a commemorative lapel pin prior to the ceremony. All alumni may request an alumni lapel pin to be mailed free of charge. Limit one per person. Alumni Magazine Subscription: Affinity magazine keeps alumni and friends up to date with main campus and nationwide news, alumni events and engaging profiles on faculty, staff and alumni who exemplify Cougar pride. Magazines are mailed twice a year and available online. Alumni Merchandise: Get CC alumni clothing, accessories and gifts at low prices through the online Alumni Store. All purchases support CCAA programming. Contact the Office of Alumni Relations for assistance. Alumni Window Cling: Display your Cougar pride on your car, at home or in the office. Request your free alumni window cling. Alumni are limited to one request but may receive up to three window clings. Class of 2019 Grad Pack: The CC Alumni "Grad Pack" is the first opportunity for alumni to display their Cougar Pride and support Columbia College. Each grad pack includes a professional padfolio and stylus pen, 2010 alumni t-shirt, window cling and a 25-percent off coupon for a future purchase on the CC alumni store. Purchase a Grad Pack. Contribute a minimum of $25 (for a one-year plate) or $50 (for two years) to Columbia College. Please send requests/contributions to: Columbia College Records & Gifts Administration, 1001 Rogers St., Columbia, MO 65216; call (573) 875-7562; or visit St. Clair Hall, Room 16. Make a contribution online. Request an "Emblem Use Authorization Statement" from the college with your contribution. Member Rewards Program: The CCAA has partnered with businesses to bring you exclusive member discounts. Click here to browse a variety of attractively priced products for you to use and share with your family. Career Services: The Grossnickle Career Services Center is available to alumni during all stages of their careers. College Bookstore Discount: Shop Cougar apparel and accessories online through the official Columbia College Bookstore, hosted by Barnes & Noble. Contact the bookstore at (800) 231-2391, ext. 7341, for additional information. Cougar Athletics and Fitness Center: Alumni are eligible to purchase a special Alumni Pass that provides alumni and a guest entry to all Cougar home games as well as use of the fitness center. Contact Drew Grzella, associate director of athletics, at (800) 231-2391, ext. 7419, or ajgrzella@ccis.edu for additional information. CougarMail Account: Register for a permanent @cougars.ccis.edu email address and you’ll always have your Cougar email with you! Contact Technology Services at (800) 231-2391, ext. HELP, or cchelpdesk@ccis.edu for assistance. CougarTrack Access: Use your CC login and password for continued access to the college's dashboard for students, alumni, faculty and staff. Library Privileges: Courtesy cards are available to alumni when visiting main campus, which will allow for the checking out of Columbia College-owned physical books. Alumni may also access the library's electronic resources during on-campus visits. Note, however, that due to licensing restrictions, alumni are unable to access the library's electronic resources from off campus. Contact the Stafford Library at (800) 231-2391, ext. 7381, or library@ccis.edu for additional information. Lifelong Learning Grant: Awarded to students who have completed the highest Columbia College undergraduate degree available at the time of graduation. For graduates of Christian Female College, this would be the associate degree and for graduates of Columbia College it is the bachelor's degree. Eligible students may enroll in one course, free of charge, if five years have elapsed since receiving their degree, they owe no fees, and they are not in default on federal loans. Students may enroll for credit or as auditors in courses being offered during the regularly scheduled semesters or sessions, provided space is available and course prerequisites are met. Students are required to pay lab fees and for textbooks associated with the courses. Students are permitted to enroll in one free course in each subsequent five-year period but may not accumulate free courses. The CCAA Lifelong Learning Grant cannot be used for graduate-level courses or any online courses. For more information, contact the Enrollment Service Center at esc@ccis.edu or (800) 231-2391, ext. 7252. Transcripts: Transcripts are provided by the Office of the Registrar. Obtain an official copy of your Columbia College transcript or have one forwarded to another institution. Request a transcript online, by calling (573) 875-7526 or email transcripts@ccis.edu for additional information. Designed in 2014, all alumni may request a commemorative lapel pin, compliments of the CCAA.